Vernier's Stir Station is a combination magnetic stirrer and ring stand that efficiently handles beakers and other containers as small as 50mL and as large as one litre (800mL practical capacity). 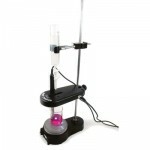 It works efficiently with beakers with a wide range of sizes and shapes of magnetic stirring bars. • Uses a closed-loop speed control, thus making it easier to fine tune its stirring speed (50–1250RPM). • The stirring platform is lit with three cool, white LEDs. The LEDs are positioned beneath the stirring platform to provide excellent lighting of a glass container of liquid. • Includes a removable 46cm ring stand post conveniently positioned and affixed to the stirrer base, at a distance that will easily accommodate most burette or utility clamps. • Runs on either AC power (adapter included) or four C batteries (not included). 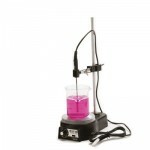 • Is sufficiently robust to operate most common-sized magnetic stirring bars or a Vernier Microstirrer. • Has a chemical-resistant plastic stirring plate. 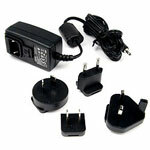 PSLP-INT power supply for Stir Station, WDSS, DCU and LabPro.